Shaping sounds is something to get lost in. Turning knobs on a new module for hours, without noticing how time flies by is something most synthesists have experienced before. The number of options to shape a sound are almost unlimited. Here we are looking at one obvious way to sculpt sound – filtering. When you take the concept of a filter and implement it several times into one module it results in something that is called filterbank. This type of circuit consists of a number of filters most times sharing one input and one output. The input signal passes the filters that are wired in parallel, this is why filterbanks are perfect tools for precise work on the frequency spectrum of a sound. Each filter usually has a fixed frequency that can be cut or boosted, either voltage controllable or not. It is not easy to define fixed cornerstones for filter banks, because the available options are so different in their functionality. Therefor we have a look at some of the concepts that are on the market today, covering a price range from ‘yeah I didn’t plan to get one, but I’ll give it a try’ to ‘uff, maybe one day’. 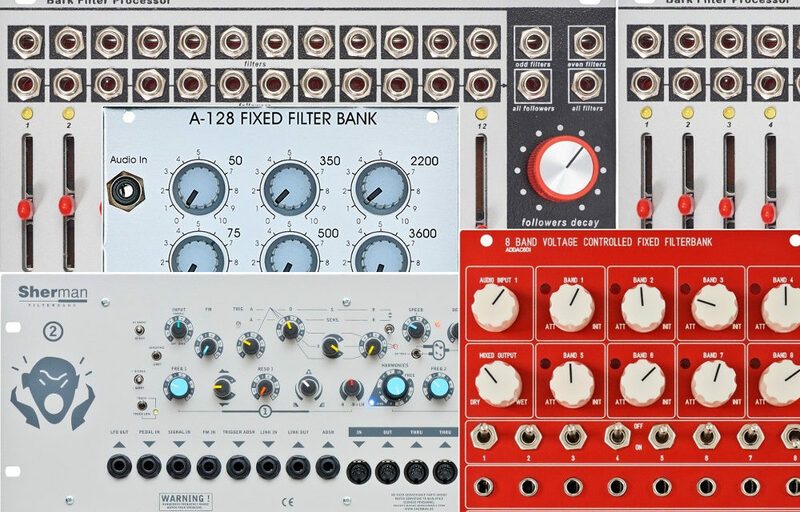 The Doepfer Fixed Filterbank might be the most basic implementation of a filterbank. One input, one output, fixed frequencies and no voltage control. It won’t break your bank, is pretty hands-on and will definitely bring something new to your sonic repertoire. With 15 fixed filters, one low-pass at 50 Hz, one highpass at 11kHz and 13 bandpass filters in-between, there is a lot of potential for precise sound design. The Doepfer excels in feedback loops for example. Using it in the feedback loop of a spring reverb or delay is a great way of controlling and shaping the character of these effects. Or use it with your noise sources, or literally any other sound source to cut unpleasant frequencies and leave room for others. The ADDAC filterbank is a lot more complex than the Doepfer, but features “only” eight filters bands. Each band features voltage control of its amplitude and a separate envelope follower, which lets you extract voltage control signals from your audio input – a very handy feature. There are two audio inputs but a total of 12 audio outputs – one for each band (post a VCA), one for the even, one for odd frequency bands and an output each for the dry and wet signal. The ADDAC Filterbank is a very versatile machine to sculpt any audio material and additionally to extract control voltage to either spread across your system or modulate the filterbank itself. Cross-patching the envelope follower outputs to the amplitude CV inputs should be fun, as well as feeding the even/odd outputs back to the second audio input. Even more sophisticated is the Verbos Bark Filter Processor. It basically features everything the ADDAC offers plus a bit more – first of all those nice faders that some other Verbos modules feature as well. This special filterbank is based on the Bark scale, a psychoacoustic perceptual scale of pitches with 24 ranges of frequencies. The module’s twelve frequency bands represent roughly ‘every second band’ from the Bark Scale: <100Hz, 300Hz, 510Hz, 770Hz, 1.08kHz, 1.48kHz, 2kHz, 2.7kHz, 3.7kHz, 5.3kHz, 7.7kHz and >10,5 kHz. The 24 frequency ranges in the Bark scale are graded in 24 Barks and doubling of the Bark value means that the corresponding tone is perceived to be twice as high. Each filterband of the Bark Filter Processor corresponds to one of the faders, the levels of the filter bands can be set and modulated in a number of ways – manually with the fader and/or with a CV which is injected into the socket below the fader. On the other hand there is the scan function which dynamically controls several bands, independent of the faders: “Frequency Scan” sequentially scans through the frequency spectrum, with Center and Width determining the center frequency and bandwidth; “Spectral Tilt” either emphasizes the low or high harmonics. Especially these functions, the look and feel and the special selection of frequency bands set the Verbos Bark Filter Processor apart from other Filterbanks. This is not a eurorack module, but something that can give you a similar experience with lots of in and outputs are available to interact with your other machines. An absolute classic – available for about twenty years and still able to gain more interest. The different versions of this machine cover all kinds of applications; there are rack-mounted versions for mono or stereo, tabletop models and the latest edition – the Sherman Filterbank 2 Compact. The Sherman has a different structure than the eurorack filterbanks described above. While only featuring two (multimode) filters it also offers envelopes, noise, FM input for external audio – LFO or other CVs, VCA overdrive with additional AR envelope generator and a ring mod input. This is a lot to play with. The combination of the different sections remind a bit of resonators or even whole synth voices, only without VCOs. But with the two multimode filters with adjustable cutoff frequency and resonance, overdrive capabilities and playability, this is a really interesting tool for shaping sounds. And the Sherman Filterbank is an instrument in itself, by using it without an input there is a noise source active that you can run through the rest of the circuit. This piece of hardware really is a tool that wants your attention, but it pays back with massive audio adventures. You want to hear the Sherman Filterbank on stage? Here is a video from SUPERBOOTH17! This is by no means a complete overview of the available modules or a full review of the modules discussed. The what about… texts are here to give you new ideas and maybe another perspective on things. All these modules offer more features than we have talked about in this post. For further information please click the provided links or – even better – visit the shop and ask the SchneidersLaden experts in the showroom.